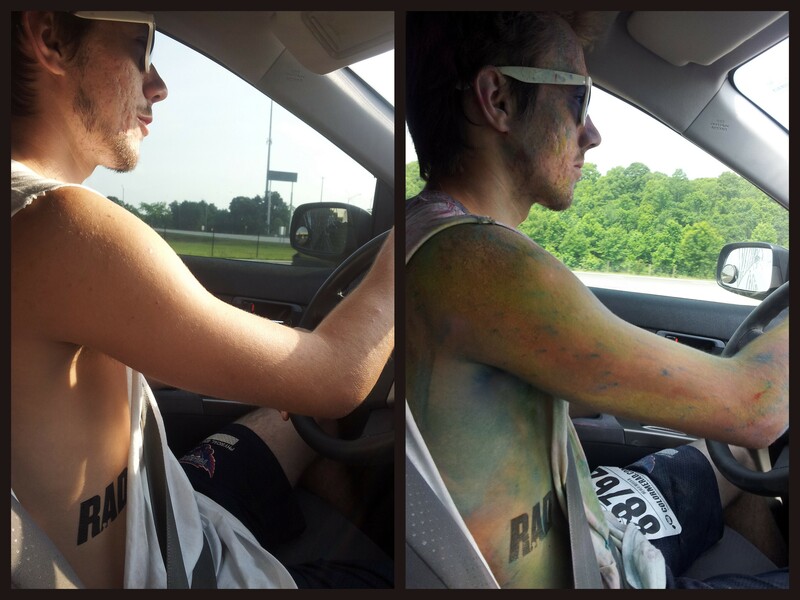 Saturday morning me and mine and my sister and hers all got up at the you-know-what of dawn and went to Color Me Rad. Our (8 between us) kids ranged from her 3 year old twins to my 20 year old, we were quite the rag tag assortment. We were a little late (we have a rep to keep up) and it was a wee bit warm but there was a nice breeze, they were handing out plenty of water, and we had a blast. I think the kids favorite part is that they were not only allowed to get dirty, they were allowed to get OTHER people dirty. 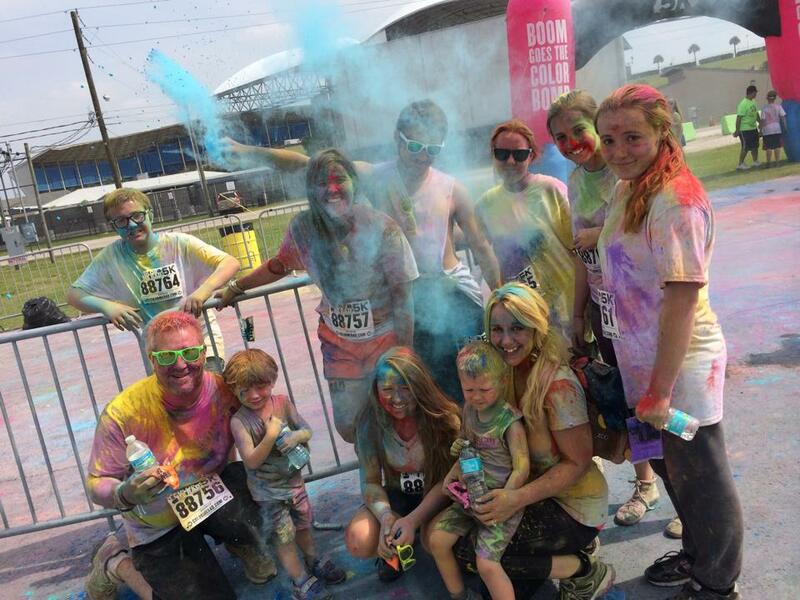 The twins were rubbing their hands in the colored powder on the ground and then on peoples shirts, pre-school heaven. Here’s our running crew. Needless to say we did a whole lot of walking and trading the wee ones back and forth; they walked, ran and hitched rides at will. The run was on the fairgrounds so we didn’t feel uncomfortable letting the older ones run ahead of us. No cars and nowhere to get lost! As much as I’d love for these fun runs to instill a love of running in the kids you really can’t say what will happen. But I can say that events like this are a great way to spend the day as a family, get away from computers, and make great memories. And my kids have all of their race bibs pinned to their wall. I didn’t suggest it, so it makes me happy to see that they are proud of them. And seriously, who couldn’t use a little more boom, a little more rad, and a little more color in their day? To top it all off I had the added benefit of a build in chauffeur. I still don’t get why people don’t love having teenagers around. Well, OK, it depends on the day. My family’s other favorite thing to do together is eat, the family is Italian so we can get 40 people and 10 pounds of pasta together in a heartbeat. Like magic! The family that plays together… probably bickers all the way there and back, but whatever. How about you, what do you and your family like to do together? 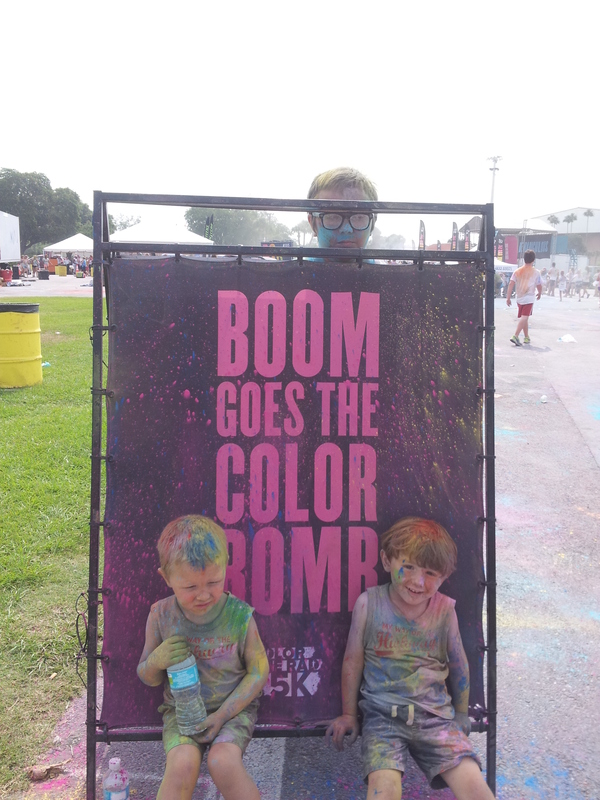 Disclosure: I received race entries in exchange for posting about Color Me Rad. And I Never Even Took a Magic Class! 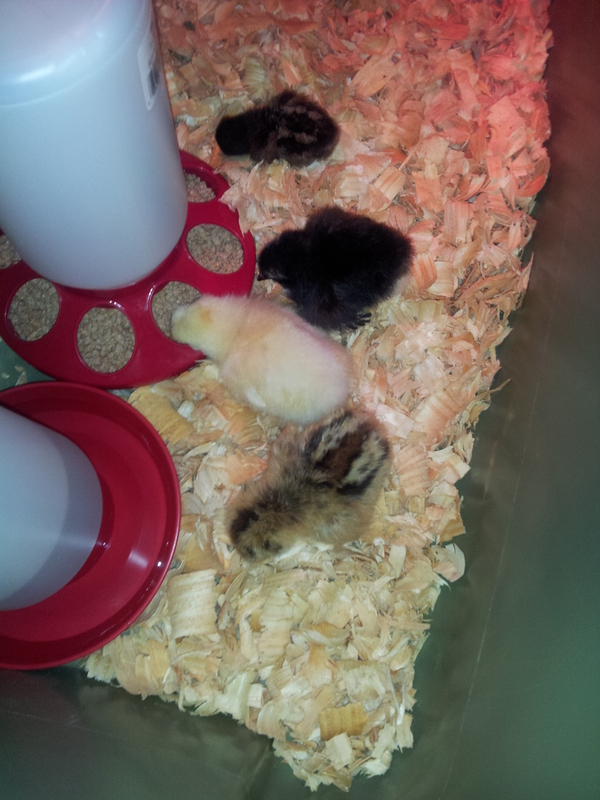 Remember the 4 cute little baby chickens I got almost 3 months ago? I bought pullets, meaning (in secret chicken people language) that they were future egg laying hens. Well, not so much. The cute little yellow fuzz ball started crowing when it was about 2 months old. Guess what’s against my HOA rules? I mean besides all the other stupid stuff. Roosters. And as much as we liked Nugget, we couldn’t argue that the crowing was obnoxious so we gave him to someone who’s daughter wanted a pet rooster. I know, weird. The very morning after Nugget was gone (and the hens cried all night, for real) the little mini chicken, Baby, started crowing. Apparently he was intimidated by the huge rooster and didn’t show his true colors until Nugget was gone. So he had to go. We gave him to a family that had 6 bantam (little) hens. They were very nice and even offered to send me pictures of him in his new home since I had said they could only have him if he wasn’t going to be a meat chicken or raised in a tiny box or something. But wait, that isn’t a chicken! Because fate says I obviously don’t have enough animals the guy who took Nugget, the 1st rooster, offered me a cute little 9 week old bunny in trade even though I already said I was just giving him the rooster. Who would say no to that? Of course since I hadn’t actually planned on getting a bunny we had to run out that night and pick up food and hay and such necessities. Oh yeah, and since we didn’t have a rabbit hutch just laying around (s)he is living in my bathroom. Ya, it’s kind of unconventional but it’s litter box trained and runs around my room when I’m in it for exercise. Someday my chicken coop will be finished and I’ll build a hutch. It WILL happen. All that’s left on the coop is a ceiling and door, the only reason it’s not done is I can’t fit those supplies in my Prius so I have to wait for my dad’s truck to be available to make the Home Depot run. I’m pretty sure that since my 9 are divided between hens, a bunny, dogs, and rats I can’t be considered an animal hoarder. I’m pretty sure hoarders pick an animal and stick to it. Right??? I am, however, definitely at the point where even a goldfish would cross the line into too much! How about you, what kinds of pets do you have? Did you get any of them spur of the moment? I’m not the only one who couldn’t turn down a baby bunny, right? 10K Update 2 and Margarita Fest Winners! First things first, the winners of a pair of tickets to the Margarita Festival in Tampa are Elliot W and Chris B. Congratulations, I’ll email you your tickets tonight! I also want to check in on my journey to a 10K. This last week was not as successful as the first 2, I’m going to repeat the week. Sunday was my ‘long run’ of 3 miles. It was also Mother’s Day and I talked my oldest son into going with me to meet a running group and do a trail run. Happily, everyone there was really nice and I had a great time. Unhappily I forgot that trail running in Florida often means running in soft sand which totally and immediately wrecked me. I have no idea how far we ran because I brilliantly tried to use a new to me program to track mileage but didn’t actually mess with it to see how to use it before starting to run. Brilliant! I decided to turn around and head back, and found that we had gone pretty far, but I really doubt it was 3 miles. And also, we made a wrong turn on the way back because if I’m in the woods I kind of have to get lost a little. Especially if there are witnesses. I wasn’t too torn about not making my 3 miles since the terrain made it feel like about 30. I without a doubt worked harder than if I had done 3 miles on the treadmill! But then Tuesday I didn’t run do to poor planning on my part. Thursday I did run but instead of 3.5 miles on the weekend I only did 2. Blah. Do you have a backup plan for when things come up and throw you off schedule, whether it’s a running schedule or something else? If you are following a training plan do you have a problem with doing a week over if you do not have a hard date (like a race) you have to be ready by? I said that I was starting a 10K running program and that I’d start doing a weekly update, I bet since you haven’t seen an update you think I quietly skipped out (again), right? Wrong! So far so good, no skipped or moved runs at all. I decided it would not be a cop out to add a cushion week in before starting the actual plan since it had been a while since I ran and I didn’t want to give myself an excuse to quit the first week! I’m running Tuesdays, Thursdays, and Sundays. I may switch that to a Saturday here and there since a weekend run is a weekend run, but no other editing. My add on week was a 2 mile, 1.5 mile, then 2.5 mile run. This week I did a 2.5 Tuesday and 2 miles tonight. So far they’ve all been barefoot and on the treadmill. Sunday I’m meeting a running group (never did that before) and will do a 3 mile trail run. That’ll be fun! My oldest son is going with me so I know I’ll finish, I don’t run with anyone else often so when I do I don’t even notice the miles because it’s something different. I’ll wear my minimalist shoes for that and maybe for all of my ‘long’ runs because the 10K I think I’ll be signing up for is a midnight run and I was told the turnaround part is really dark. I like barefoot but not in pitch black conditions! I’ve been doing yoga after every run and though I can’t say it’s been easy for me to finish all the runs I can say I haven’t been sore anywhere or had any real issues finishing. I just have a horrible habit of looking at the mileage every 2 seconds which make my runs seem to take FOREVER. I’ve been listening to Zombies, Run!, Rock My Run, and podcasts and it makes a big difference. Especially if I hit on a really funny podcast. My one fail has been cross training. I haven’t been. It’s part of the plan and I need to get started on it. I wish my Radio Flyer looking bike wasn’t messed up, that would make cross training fun. I did go kayaking last Thursday, that counted as cross training for certain, even if it was a run day! Lots of other great non-running things have been happening too. 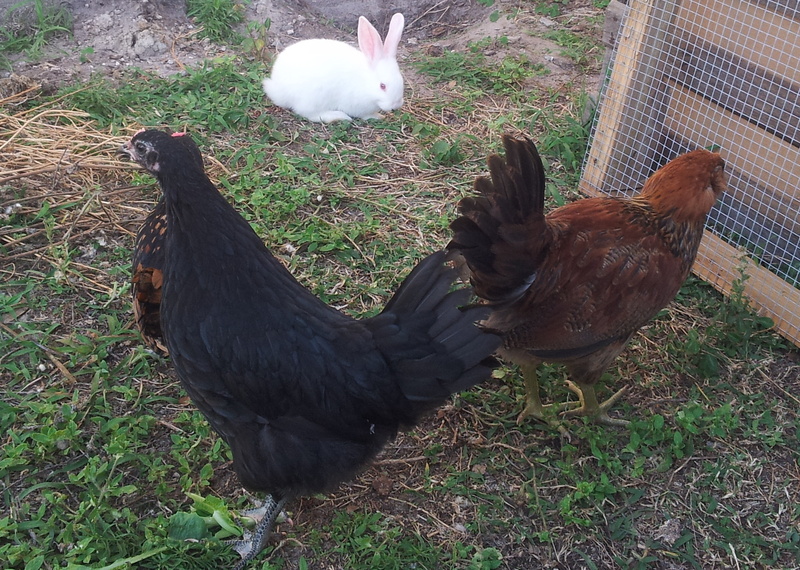 I’ll have to give an update soon on the garden, the chicks, our newest farm-y addition and some other things like a giveaway to the Margarita Festival coming up in Tampa! Are you training for or starting anything new? How’s it going so far? I love the first few weeks of pretty much anything, it’s always so much fun to start something new! Last weekend I went to an award ceremony for the Zombie Film Festival, and the week before I went to their second premier night to watch a bunch of short films, all about zombies (as you may guess). What fun! 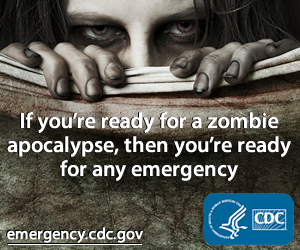 What is a Zombie Film Festival? Participants get 30 days to create a film and all films have to contain certain elements. I know these had to have a particular quote, a zombie joke, a plunger, and a few other items. It was really fun to watch for the requirements in all of the different films. After the award ceremony the second Friday there was a really fun punk band, The Funeral Dazies. All of the members were zombies, and body parts did occasionally fly to and from the stage, but I’m sure they were basically nice people. 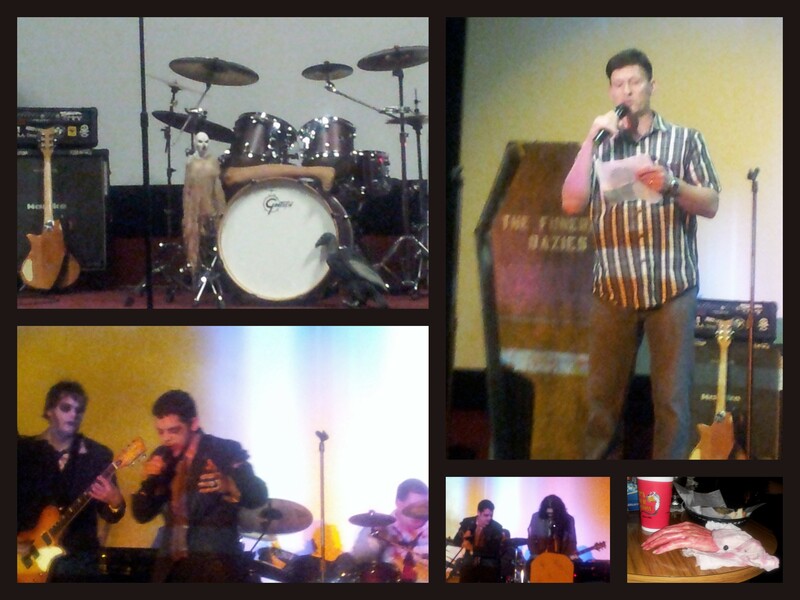 Here’s the band, a stray body part, and the awards announcer. They look nice, right?? So how did I know to go see all of this awesomeness when you didn’t even know it existed? I have an in! I know a really great group of people who happen to have just started a film company, Atone Films. Their film, In Vain, won an award! Here’s the link to the short film, check it out! Then go over to Atone Film’s new Facebook page and let them know if you like it! The lead in the film happens to be the guy I’ve been seeing for many a year, do I know how to find the good guys or what?